The Canadian fitness guru who showed us how to slow--even reverse--aging in Aging Backwards is back with a revolutionary way to cure chronic pain with movement. Our bodies are designed to be pain-free through our lives, but to achieve that, we have to move. 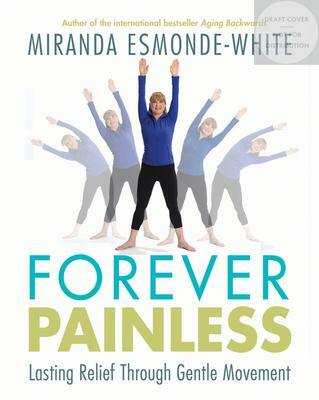 In Forever Painless, Miranda Esmonde-White introduces us to a new understanding of how chronic pain begins when our muscles become unbalanced and cause connective tissue problems. Something as common as daily habits or as unexpected as accidents or injuries create imbalance, and we compensate by favouring our weaker part, leading to strain on our feet, ankles, knees, hips, shoulders, upper back, lower back, elbows, wrists or neck--and eventually such conditions as arthritis, chronic back pain, plantar fasciitis and fibromyalgia. Hips and knees are especially problematic: surgeons often tell those with chronic hip or knee pain to tough it out and come back in two or three years when the damage is sufficiently severe that only a joint replacement will do. Forever Painless deals with preventing and reversing imbalances so you can live a pain-free life. Forever Painless will teach you a new way of looking at your body, providing neurological and physiological explanations of the causes of most chronic pain and teaching you simple exercises that real people have used to become free of pain and regain mobility. The solution is right under our noses, it's free, and it doesn't require drugs or surgery: it's gentle rebalancing exercises. The Canadian fitness guru who showed us how to slow--even reverse--aging in her international bestsellerAging Backwards, is back with a revolutionary way to cure chronic pain with movement. "Our bodies are designed to be pain-free through ourlives," says Miranda Esmonde-White, "but to achieve that, we have to move." Forever Painless will teach you a new way of looking at your body, providing neurological and physiological explanations of the causes of most chronic pain and teaching you simple exercises that real people have used to become free of pain and regain mobility. Among those who have conquered their pain using the techniques in this book: the director of child services in New York City who used these exercises to recover from disabling chronic back pain; an accountant who avoided major bone reconstruction surgery through 20 minutes a day of stretching and strengthening; a prima ballerina whose career was extended by five years when Esmonde-White's exercises relieved her debilitating hip pain. "It's time to change our relationship with chronic pain," Esmonde-White writes. "The solution is right under our noses, it's free, and it doesn't require drugs or surgery: it's gentle rebalancing exercises."